Holy wow.. that awaken baked looks fabulous! That Chocolate Nookie Cookie looks to be a Winner, Natalie. Love the flavors and concept behind these cookies. Just don't eat the aphrodisiac one at work lol. I'm a big fan of ginger too. I can't enter the contest because I'm Canadian, but good luck to the rest! Akiva from The Cookie Department here. Natalie, thank you so much for the great review of our product. Your fans are already starting to comment on our FB page! We can't wait to send out these boxes of cookies to two of your winners. Thanks again. What a neat idea for a business! Now why didn't I think of that???? How fun and so very clever! Mine would be the Awaken cookie for sure, but then I would try all of them one by one! They look fabulous. I would love to have that peanut butter protein cookie! The espresso cookie sounds CRAZY good. Would love to try that one out! They all look so delicious ! 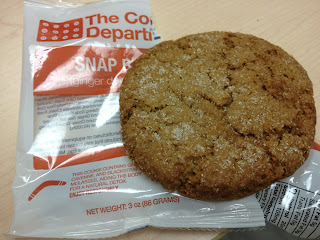 the ginger snap or the peanut butter. though they all look good. ANything peanut butter is my favorite! Wow, what a great giveaway! The Awaken cookie sounds good to me! Looks so good, I think I would love the Peanut Butter Cookie. A FUNCTIONAL cookie...now that sounds awesome. I always love another excuse to eat cookies! The Snap Back sounds amazing - such a great idea! 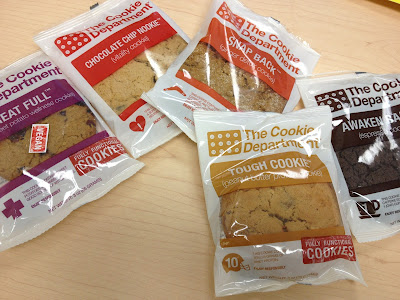 You seriously had me at cookie, and then I saw that they were a functional food cookie. Ummm GENIUS. I probably would eat all of them. These are new to me! Terrific idea - I'm going to have to check these out. Really good stuff - thanks. The Tough cookie sounds so cute! I am nuts over cookies so these functional cookies are super intriguing to me. Can't win any but would try them if I come across them. I totally want to try so many of these cookies, but you have me convinced that the ginger ones would be my fave! They look so yummy, esp the peanut butter one. The chocolate chip nookie looks so good! A CEO of all things cookie? My dream job! I'm going to have to go with espresso, but let's be real: I'd eat any of these! What a fantastic idea! I love them :) I should pass them onto management! The choc chip cookie looks amazing!